Hot Coals Theatre is celebrating their 5th anniversary with a residency at the Park 90 theatre in Finsbury Park for the month of April. 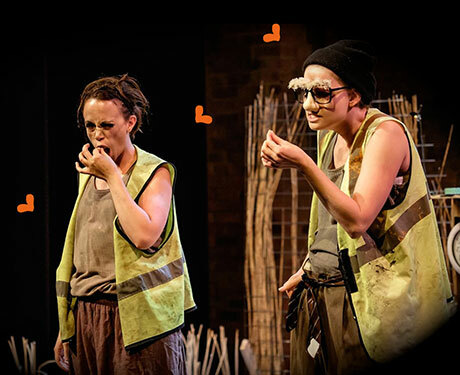 This innovative and imaginative duo of Jo Sargeant and Claire-Louise English are creating a reputation for excellent physical theatre and clowning and their latest show Finders Keepers will appeal to all ages. Directed by Caroline Parker MBE, in this production they play a father and a daughter living in a junkyard whose daily routine is disrupted by an unexpected delivery and together they have created an integrated (d) deaf accessible show which is charming and touching to watch and full of good physical gags and business. Jo and Clare-Louise delight in playing the cartoonish twits and without words convey their story and emotions while interacting gently both with a cute puppet and with the audience. In particular a charming sequence when they react to audience laughter and silently ask for quiet to let the puppet sleep which simply creates more laughter. The moment you enter the venue the visual treat begins with an atmospheric, smoky night sky designed by Marine Le Houevec, enveloping the ramshackle home built from pallets and scaffold .The ensuing story is backed by tightly choreographed soundscape of music and effects designed by Chris Drohan which integrates seamlessly with the on stage mime and clowning. The story has strong echoes of the biblical tale of Moses with references to Pharaohs, Herod, Levites and banned baby boys but it is the timeless theme of the bond and joy between a parent and their child and the emotional impact of their separation that is at the heart of the show. This show has developed on from its successful run at Edinburgh Fringe in 2017 with a stronger back story and some new business, some of which elongates the show to over an hour. It succeeds because of the two actresses’ comic timing and natural clowning skills. Jo and Clare-Louise, Marine and Chris, and the Technical Stage Manager James Humby are all RADA graduates and this production showcases both the talent that RADA attracts and the training it provides. 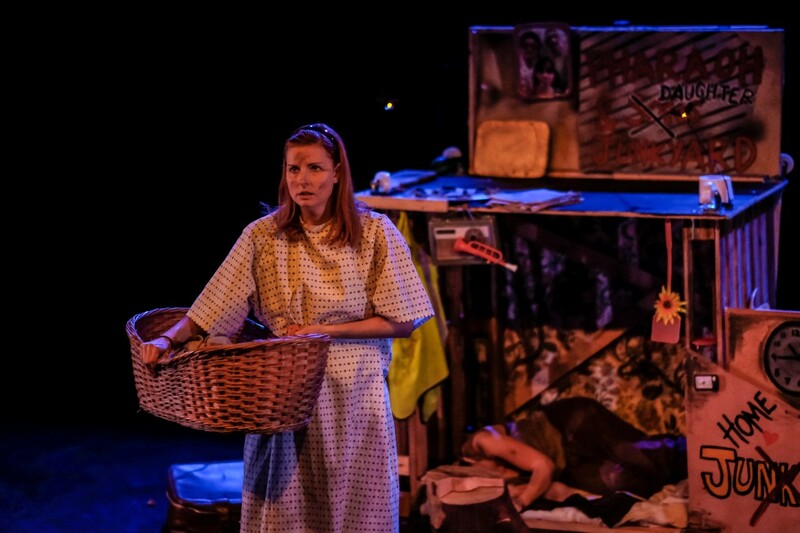 Deaf-infinitely worth catching Hot Coals Theatre at the Park 90 and watch out for more innovative, integrated and charming productions in the years to come from this company .